JJVD has been worked on many projects sine 2006. Below is a list of our recent projects! In the oldest Welsh church in Waukesha County, Bethesda Presbyterian Church, we film and witness the union of Dave and Leslie. This quaint and cozy church seemed appropriate as we ventured to Old World Wisconsin in Eagle, which was recently ravaged by dangerous storms earlier in the summer, to celebrate their marriage in the Clausing Barn. A hot day could not keep the family and friends from having a great time, as JJVD provided some last minute editing on their Video Montage and helped provide audio assistance to the venue. It was our pleasure to be able to support and participate in the union of Dave and Leslie and wish them a continued life of love and happiness. On the fourth level of the Atrium at the palacial Lambeau field, we continued our filming the celebration of the marriage of Chip and Dawn. 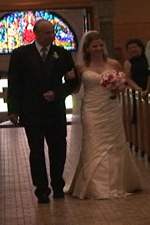 The newlyweds have just been united earlier at beautiful St. Francis Xavier Cathedral in downtown Green Bay, WI. With good food and drinks, a beautiful bride and handsome groom danced the night away with their friends and family, which seemed to end perfectly with the July 4th fireworks lighting up the bay. We truly appreciate being able to share in their special day and wish them a long and happy marriage. Being lovers of the game of golf (ask us about our charity tournaments) we jumped at the chance to help several aspiring young golfers advance to the next level in their game. When a golfer wishes to go to a special golf school to hone and perfect their game, they are required to submit an “audition” video highlighting their skills in a variety of circumstances. Working with the golfer, JJVD incorporates their wishes with our filming expertise to make a video that will show the golfer just how great he or she is. For several of the past years, the City of Waukesha Parks, Recreation, and Forestry Department has been nominated to the short list of Gold Medal Parks, a nationally recognized accreditation for outstanding parks and services in small and mid size cities. 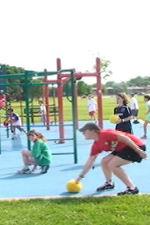 The department, in order to be considered, has to prepare a 10 minute video advertising and promoting the unique services and amenities the park system shares with its citizens. The Waukesha PRF looked for assistance from JJVD in recording events throughout the city in May and June and certain locales and points of interest. From Frame park to the Glacial Drumlin Trailhead and from Lifeguard Training sessions to all out fun at Buchner Water Park, JJVD was there with cameras in hand. We logged over 35 hours in recording events and park sites all over the city of Waukesha. We sincerely think that Waukesha PRF offers services and amenities second to none, and hope they claim the Gold Medal later this year! Under the powerful voice of the canter of St. Paul’s Lutheran Church (Oconomowoc, WI) singing Ave Maria, we find the bride, Megan, and groom, Matt, normally outgoing and vivacious, somewhat nervous, yet brimming with excitement. Truly, such a beautiful ceremony could only be matched by the equally beautiful day. 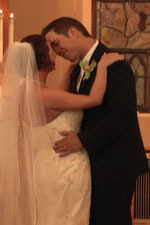 JJVD captured the wedding using two cameras and the subsequent reception that followed at Red Circle Inn in Nashotah. Friends and Family from far away gathered to enjoy the great food and drinks and join the celebration that lasted deep in to the night. We were honored to be able to join them in their special day and wish this gorgeous bride and smooth dancing groom a long, happy, and prosperous marriage together.